We follow Ben through the same period as Rosie. He’s an attractive easygoing bloke, now in his mid-thirties. He’s strolled through life, relying on his humour and the fact that pretty much everyone likes him. He works in a nondescript office but has never been able to articulate precisely what it is he does. When Rosie and Ben separate, Ben is forced to realize the world demands more of him. Aaron Blabey is one of Australia’s most sought after actors. Since playing Harvey in the ABC television series, THE DAMNATION OF HARVEY McHUGH for which he won an AFI Best Actor award and gained a Logie nomination in 1994, Aaron has successfully moved between the stage, film and television. Growing up in Bendigo in country Victoria, acting, at first, did not seem like a feasible career. But after just three days spent on an arts course, he quit university, auditioned for Harvey McHugh and was cast in the lead role. 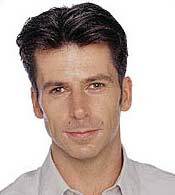 Since then Aaron has appeared on television in STINGERS, for which he gained an AFI nomination in 2000, WATER RATS with Catherine McClements as Dee Smart and was a semi regular in G.P. He has been a featured guest in GRASS ROOTS, WILDSIDE, ALL SAINTS, BLUE HEELERS, HALIFAX F.P., MAN FROM SNOWY RIVER, TWISTED TALES, DAY OF THE ROSES, FALLEN ANGELS and MEDIVAC. His film roles have included MULLET with Ben Mendelsohn and Susie Porter, ERSKINEVILLE KINGS with Hugh Jackman and MR RELIABLE with Colin Friels and Jacqueline McKenzie. In the musical SHOUT! playing the part of Lee Gordon, he had to sing. “I don’t call myself a singer or a dancer,” he said. But he sang on the show’s soundtrack, which won an Aria Award! Aaron regularly performs leading roles for the Sydney Theatre Company and Company B Belvoir and has appeared in ten plays during the past four years working with Susie Porter, Jackie Weaver, Claudia Karvan, Max Cullen and directed by such luminaries as Neil Armfield, Richard Wherrett and Robyn Nevin. It was while he was doing a workshop for the STC that he met and later married actor Kirstie Hutton. They both appeared in the hit comedy, Fred in 1999. In 2002 Aaron and Kirstie spent several months overseas. A keen artist, Aaron has painted over 70 portraits.